This childrens gardening set consists of a shoulder bag with handy pockets, spade, leaf rake, green hand trowel and hand fork, and kids gloves. 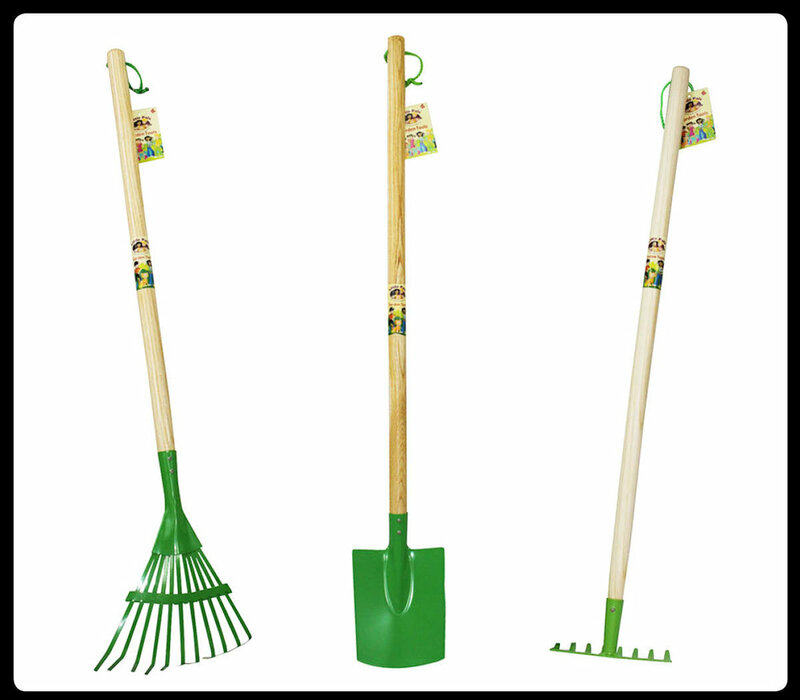 The childrens garden spade and leaf rake have bright green metal heads and sturdy wooden handles, perfect for digging in the garden and clearing up the leaves. The childrens garden gloves are all purpose two tone blue cotton gloves with knuckle guard and reinforced cuff. The hand trowel and hand fork are ideal for smaller hands and have a sturdy wooden handle. Recommended Ages 3 to 10. Measures: 33.5"L x 8.3"W x 3.5"D; 2.3lbs. Long handle tools designed perfectly for small hands are now available separately! Brightly colored metal heads and sturdy wooden handles encourage young, budding gardeners to be just like Mom and Dad! Trunk kids into little helpers with this all-in-one cleaning set! Great for sweeping by the garden, sidewalks, patios, playing house, and more! Includes handy carrying and storage bag, high-quality sturdy broom, metal dustpan, and all wooden hand brush. Broom and brush have soft bristle heads. Recommended Ages 3 to 10. Measures: 29.1"L x 7.9"W x 2"D; 1.6lbs. Hand trowel and fork designed perfectly for small hands are now available separately! Brightly colored metal heads and sturdy wooden handles encourage young, budding gardeners to be just like Mom and Dad! Our Pink and Blue Tool Pouch Kits are just right for keeping everything at hand during a stint in the garden! Includes green tool pouch, hand trowel, hand fork, and children garden gloves. Gloves have a wide cuff and extra fabric over the knuckles to help protect little hands. Recommended Ages 3 to 10. Measures: 10.6"L x 9.4"W x 2"D; 0.7lbs. A fun an easy way to get the kids involved with gardening! Sets include watering can, gloves, and hand trowel - sized perfectly for little hands. Use the watering can for easy storage of the gloves and tool. Recommended Ages 3 to 10. Measures: 9.1"L x 11.4"W x 5.1"D; 0.9lbs.